Former Penthouse Pet (June 1985) Lisa Ann Taylor, known professionally as Melissa Wolf, recently made headlines after she was arrested for running a brothel and call girl ring from her mansion in Atlanta’s upscale suburb of Duluth. I’d hazard to say most, if not all, the allegations against her are probably true, and I sure can’t tell you anything about the particulars of the case that you couldn’t read in the numerous articles on it (one of the better ones here), but I can tell you that I did have the pleasure of meeting Miss Taylor/Wolf during her engagement at Nashville’s Club Platinum in late-1994. I don’t remember what songs she danced to or if she did her noted “Popsicle Disappearing Act” (and that sounds like something I’d clearly remember) but she jokingly told me she started very young, at 12, when I mentioned to her that it seemed like I’d seen her in magazines for years, but she couldn’t be any older than me. I also observed her to be very gracious and she seemed very friendly toward the house dancers. Trading card given to me by Melissa. 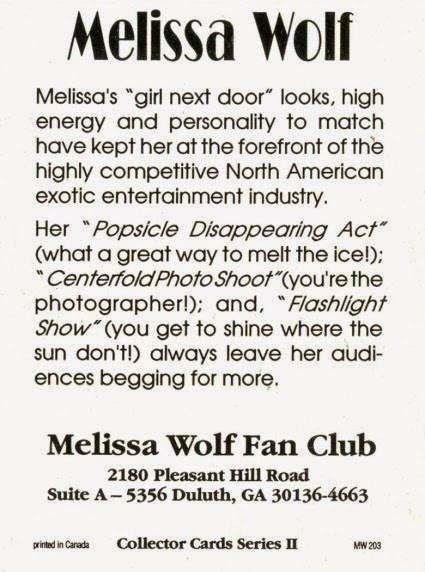 Note, even back in 1994, her fan club had a Duluth address. Research revealed the address is that of the Gwinnett Mall/Kroger shopping center. “Suite A” is a Mailboxes Etc. there and “5356” is her box number. You didn’t think that was the address to her mansion, did you? Since the original “hang in there, baby” image of a kitten struggling to hold on to a tree branch, started appearing on walls over 40 years ago, motivational posters have been created to inspire us to persevere when the going gets tough.